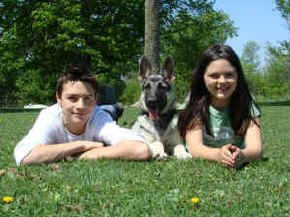 Back to main Puppy House view new puppies for sale here, deposit and guarantee and more. 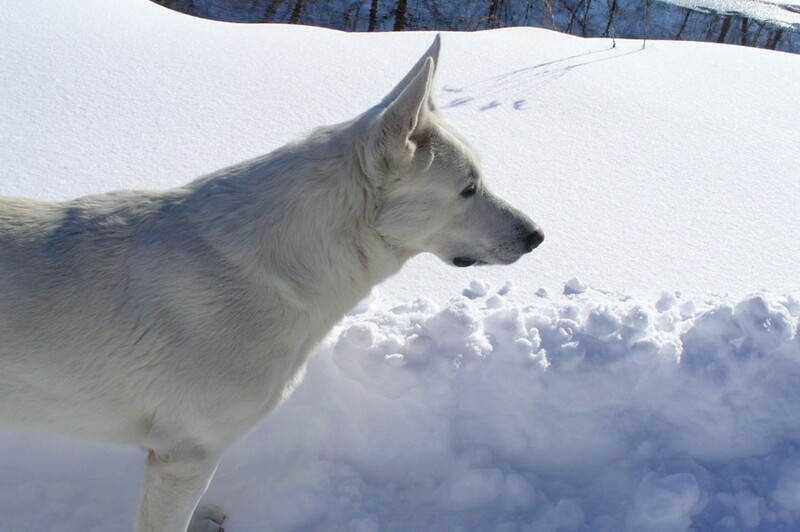 Thank you all for sharing your photos with us of these beautiful dogs!! Sorry I am a little late getting these out to you. We celebrated Cirrus's 4th birthday last month! She continues to be a invaluable member of our family. She is the perfect combination of friend and protector and it would be hard to imagine our world without her by our side. Once again, we are grateful for her companionship and wanted you to know what a blessing she is and continues to be in our lives. Thank you! And we just love them. 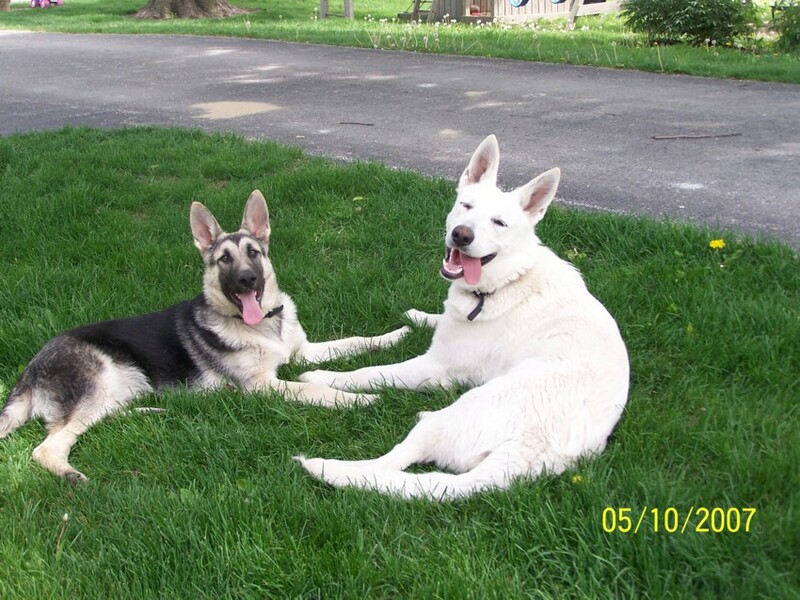 The vet states, "these are the nicest and most beautiful shepherds that come into our office". We think so too... Thank you again for these wonderful dogs. Hello! This is Carly Blackmon, the fiancé of Vinny Miata, who recently purchased a silver sable male pup from you born Sept 11th of Micah & White Golde Girl. His AKC number from the paperwork you sent is DN34940410. I know my fiancé wrote you already to tell you he arrived safely and was lovingly placed in my arms as I shed tears of joy to see him for the first time. I wanted to not only thank you for all you do to raise such beautiful pups, but fill you in on how this little boy is adjusting to his new home! Loki has a wonderful temperament and is so smart that he has already mastered the commands "Sit", "Give a Paw", "Give Kisses", "Lay Down", "Stay" and "Come". He is doing great with his housebreaking, for the most part ;) and has given Vinny & I so much joy since the day we got him. We have spent a significant amount of time educating ourselves on German Shepherds and take his training and behavior very seriously. 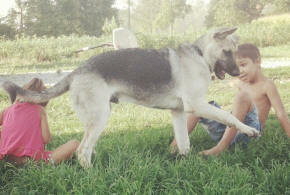 Loki has been a dream to socialize and has interacted wonderfully with people of all ages and other animals. His sister Ava (my cat) has not been phased by his arrival, she was used to living with dogs where she was raised at home with my Mom, and she playfully steals his bed when he isn't looking. You'd be happy to know that Loki is cared for to the highest degree possible. He has a basket overflowing with toys, comfortable bed/blankets and plenty of fresh food/water and treats. My mother lives not too far away and is our permanent puppy sitter for any time that Vinny and I may need to travel without him. 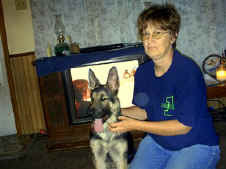 She is a fantastic pet owner and dog trainer who has raised many well behaved pups ever since I was a child. 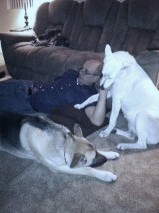 Loki will never have to stay in a kennel, he is and will always been welcomed to our families' homes. I have attached some pictures of him over the past month to show you how much he is growing already. We're amazed at how quickly he has begun to grow up and have already had to purchase a much larger bed as a Christmas present to him since he has almost outgrown his first one! He definitely takes after his Daddy and will clearly be a big boy one day! Vinny and I wish you very Happy Holidays and thank you once again for the gift of this beautiful dog. He is beyond loved, and we are committed to giving him a lifetime of devoted care. We will keep you in the loop with follow up on him as he grows more! Take care! 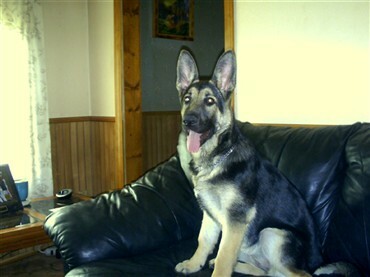 Subject: Our little boy at 6 mths! Sorry it took me so long to tell you how Lilly is doing. You sent her to me Jan. 11, 2012. She is the perfect puppy. Photos taken shortly after she was spayed March 13. Per vet's instructions, she takes a mild glucosamine tab a day and is on large breed puppy food. One photo shows her with me taken last month. She hasn't grown into her ears or feet yet. Another photo of Lilly with her constant companion, Casey(1/2 Rottweiler and Blue Tic Hound), 2 1/2 yrs, checking out my daughter's dog Chloe, a Rottweiler. About twice a month, I take Lilly and Casey over to my daughter's 10 acre homestead and the dogs have a grand time running and chasing whatever to their heart's content. Always asked where I got her and I tell them, emphasizing how pleased I am with Lilly and with the adoption process and professionalism and care you show. Thank you. Dear Jane and Joe here he is...such a sweetheart! what a calm personality he has...and gorgeous! Sorry we haven't sent pictures sooner but we've been busy with training Casey. She is doing better than anyone expected! She has 180 legal finds in dope so far. Her training started when she was 10 weeks old and she is so smart. She is a good people dog and does very well riding in the squad with me. When I put on my uniform she knows it's time for work and she waits for me by the front door. She will have her state certification in obedience next week. Other officers are very impressed with her and can't wait till she's on the road which might be as soon as the end of May. Will keep you posted and send more pictures soon. Just wanted to drop you a line and tell you again THANK YOU SOOOO much for the wonderful gift we have in Halo! We love her so very much! She is perfect. 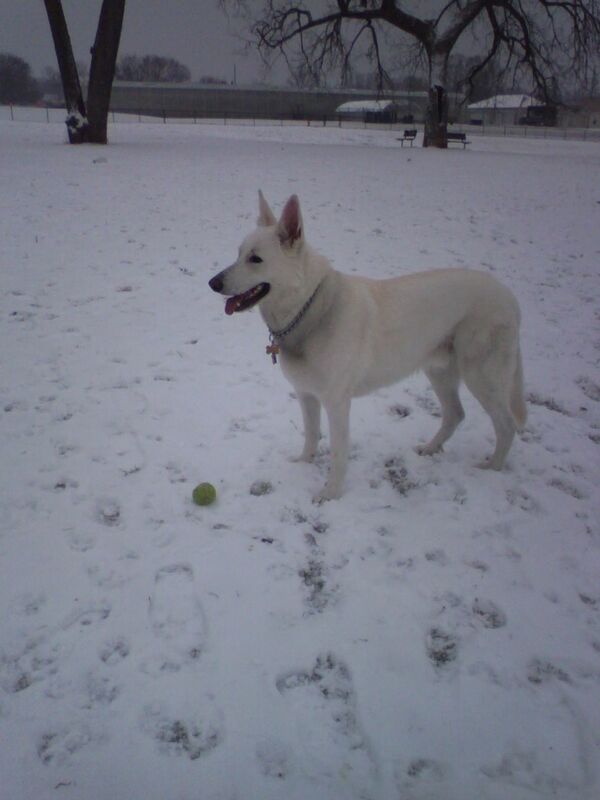 I told David this morning, we have never had such a wonderful puppy or dog ever in our lives. She is a ray of sunshine everyday. I hate to admit it, but she is a momma's girl. Halo and I spend everyday together, and I take her everywhere. Even on school field trips and to track meets!! She has learned to ring a cow bell that we hung by the door, when she needs to go out and to come back in! It is great! She will graduate puppy class tomorrow with flying colors. She is growing so fast and both her ears stand up beautifully now. She is so gorgeous! I can't wait to have her wake me up every morning to go outside, she starts my day off in such a good way, puppy kisses what could be better! We hope you are all doing well. We just can't thank you enough! PS , she is all ears!!!! what a pretty girl!!! Decker is now living in Canada.. Carmen and family had lost their beloved German Shepherd Tucker and wanted a family pet not to replace tucker but to once again share the love they have for the German Shepherd breed, They are very special people who have a very special puppy they named Decker... What a smart and very well behaved handsome boy he has turned out to be. 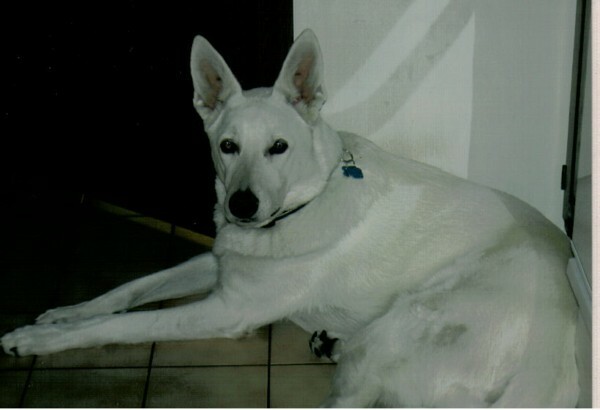 The pets we love and miss will be in our hearts and memory forever, they are our families, we miss them and remember them often and I Thank God that he has made our human hearts large enough to love again and again, we have been there and know that loss and Joy. Decker is doing very well. He is sleeping about 8 hours every night and has been very easy to train. We as a family take long walks at night and one of us usually takes him for a walk in the morning. He travels very well. Once the truck starts moving he falls asleep. This weeks lesson has been on heeling and he is picking that up quickly. first one is from this week and the other two are from last week. We hope all is well with you. Riddick - updated photos on 4 -2007 He looks like his daddy!! Male out of April 04 litter at 13 months, HE IS A BIG BOY, 93 pounds at one year! From April - Kotas new owners. 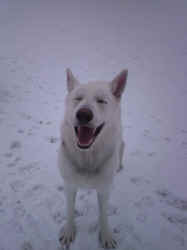 Bella is 7 months old in this photo she was born April 2007 White Diamond and Gabriel's litter. Jane, .did you get my email with pictures attached?? She is doing wonderful! We absolutely Love Her!!! Subject: Christmas Puppies are Here! A PUPPY FOR CHRISTMAS!!!! Make someone's Christmas unforgettable! (one white, and one black & silver). Our black & silver, Guinness, has the sweetest disposition. 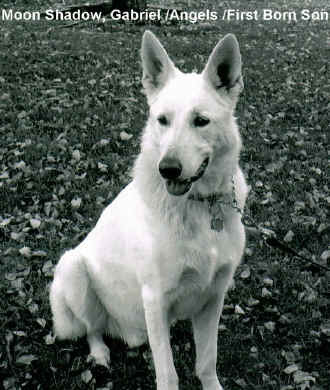 He was from Gabriel & Pearls' first litter, and a photo of him and a litter-mate is on their website. in the past. 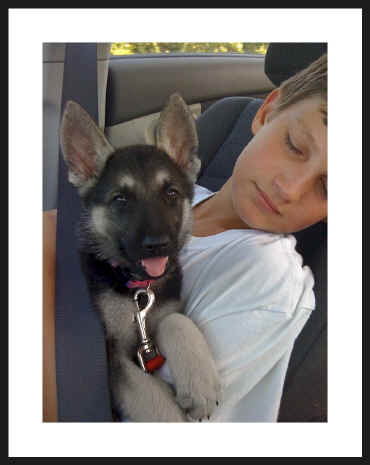 The Miceli's are the best, most reputable German shepherd breeders. They also breed great horses. They will handle ALL the details, even shipping! Master's Creek's dogs, just drop me a line or call me to see ours.